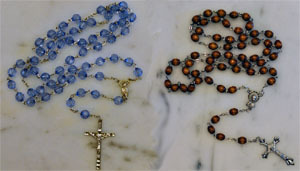 Who will pray for me when I am gone?” People often ask this question. 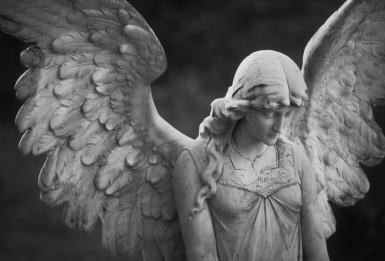 You are aware of the need to pray for your departed family members and friends. However, you may wonder if they will remember to pray for you. Hopefully, your family members and friends will remember you in their prayers after you die. There is a way, however, to insure that you will be remembered and that Masses and prayers will be offered to you. You can also insure the same for all of your family. That way is through Our Lady of Angels Association’s FAMILY PERPETUAL ENROLLMENT. The spiritual benefits of the twelve annual Novenas of Masses offered for the enrollees of Our Lady of Angels Association. 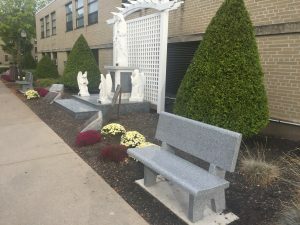 The spiritual benefits of the good works, prayers and Masses offered by the Vincentian priests and brothers of the Eastern Province of the Congregation of the Mission. A family may be enrolled perpetually for an offering of $50.00. Family Perpetual Enrollment includes husband and wife, their children, their brothers and sisters, and their parents. If the person in whose name the family is being enrolled is unmarried, the Family Perpetual Enrollment includes the person, his/her parents, brothers and sisters, and grandparents. 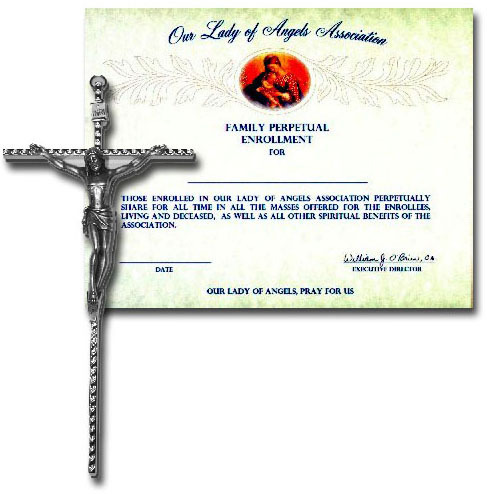 A crucifix and special laminated certificate inscribed with the name of the family being enrolled is sent for each $50 Family Perpetual Enrollment. 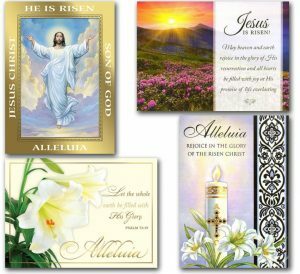 We also offer a $25 Family Perpetual Enrollment which includes a special laminated certificate and remembrance in 12 Annual Novenas of Masses. If you are interested in the spiritual benefits offered by the Family Perpetual Enrollment, please submit your offering on our ONLINE FORM. Through a Family Perpetual Enrollment you will know that you and all the members of your family will be remembered both in life and after death. Sing to the Lord a new song, a hymn in the assembly of the faithful. Let Israel be glad in their maker, the people of Zion rejoice in their king. Let them praise his name in festive dance, make music with tambourine and lyre. For the Lord takes delight in his people, honors the poor with victory. Let the faithful rejoice in their glory, cry out for joy at their banquet, with the praise of God in their mouths, and a two-edged sword in their hands, to bring retribution on the nations, punishment on the peoples, to bind their kings with chains, shackle their nobles with irons, to execute the judgments decreed for them – such is the glory of all God’s faithful. You water the mountains from your palace; by your labor the earth abounds. You raise grass for the cattle and plants for our beasts of burden. 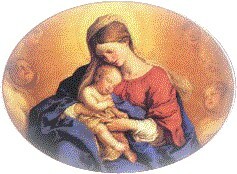 You bring bread from the earth, and wine to gladden our hearts, oil to make our faces glean, food to build our strength. The trees of the Lord drink their fill, the cedars of Lebanon, which you planted. There the birds build their nests; junipers are the home of the stork. The high mountains are for wild goats; the rocky cliffs, a refuge for badgers. Sing to the Lord, a new song; sing to the Lord, all the earth. Sing to the Lord, bless his name; announce his salvation day after day. Tell God’s glory among the nations; among all peoples, God’s marvelous deeds. For great is the Lord and highly to be praised, to be feared above all gods. For the gods of the nations all do nothing, but the Lord made the heavens. Splendor and power go before him; power and grandeur are in his holy place. We ask you to respect those who are laboring among you and who are over you in the Lord and who admonish you, and to show esteem for them with special love on account of their work. Be at peace among yourselves. We urge you to admonish the idle, cheer the fainthearted, support the weak, be patient with all. See that no one returns evil for evil; rather, always seek what is good both for each other and for all. Rejoice always. Pray without ceasing. In all circumstances give thanks, for this is the will of God for you in Christ Jesus. Do not quench the Spirit. Do not despise prophetic utterances. Test everything; retain what is good. Refrain from every kind of evil. I will listen for the word of God; surely the Lord will proclaim peace to his people, to the faithful, to those who trust in him. Near indeed is salvation for the loyal; prosperity will fill our land. Love and truth will meet; justice and peace will kiss. Truth will spring from the earth; justice will look down from heaven. The Lord will surely grant abundance; our land will yield its increase. Prosperity will march before the Lord, and good fortune will follow behind. For through the law I died to the law, that I might live for God. I have been crucified with Christ; yet I live, no longer I, but Christ lives in me; insofar as I now live in the flesh, I live by faith in the Son of God who has loved me and given himself up for me. I do not nullify the grace of God; for if justification comes through the law, then Christ died for nothing. Therefore, holy “brothers,” sharing in a heavenly calling, reflect on Jesus, the apostle and high priest of our confession, who was faithful to the one who appointed him, just as Moses was “faithful in his house.” But he is worthy of more “glory” than Moses, as the founder of a house has more “honor” than the house itself. Every house is founded by someone, but the founder of all is God. Moses was “faithful in all his house” as a “servant” to testify to what would be spoken, but Christ was faithful as a son placed over his house. We are his house, if we hold fast to our confidence and pride in our hope. Out of the depths I cry to you, Lord; Lord, hear my cry! May your ears be attentive to my cry for mercy. If you, Lord, mark our sins, Lord, who can stand? But with you is forgiveness and so you are revered. I wait with longing for the Lord, my soul waits for his word. My soul looks for the Lord more than sentinels for daybreak. More than sentinels for daybreak, let Israel look for the Lord. For with the Lord is kindness, with him is full redemption. And God will redeem Israel from all their sins. How I love your teaching, Lord! I study it all day long. Your command makes me wiser than my foes, for it is always with me. I have more understanding than all my teachers, because I ponder your decrees. I have more insight than my elders, because I observe your precepts. I keep my steps from every evil path, that I may obey your word. From your edicts I do not turn, for you have taught them to me. How sweet to my tongue is your promise, sweeter than honey to my mouth! Through your precepts I gain insight; therefore I hate all false ways. My heart is steadfast, God; my heart is steadfast. I will sing and chant praise. Awake, my soul; awake, lyre and harp! I will wake the dawn. I will praise you among the peoples, Lord; I will chant your praise among the nations. For your love towers to the heavens; your faithfulness, to the skies. Appear on high over the heavens, God; may your glory appear above all the earth. Help with your right hand and answer us that your loved ones may escape.